The Healing Voices Choir Presents: Women's Voices! 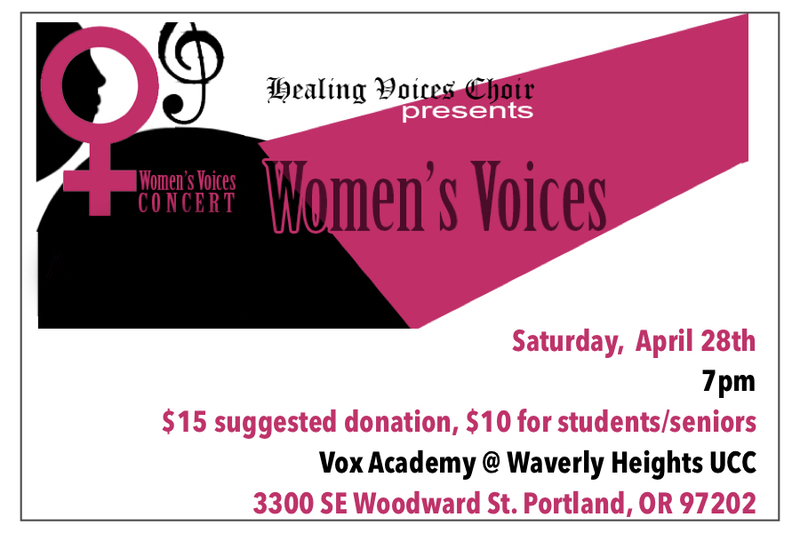 The Healing Voices Choir presents its Spring Concert: Women's Voices! This joyous community choir will share inspiring choral works by female composers including Gwenyth Walker, Joan Szymko, Gabriela Lena Frank, Elizabeth Alexander, Ysaye Barnwell, and others. We hope you will leave inspired to voice yourself, and to share and amplify women's voices. This concert will also feature some thrilling solos and chamber selections. This small but lively choir is dedicated to healing each-other and our community through song; don't miss this opportunity to join us in musical celebration! A suggested donation of $15 ($10 students/seniors) will be gratefully received at the door. The Healing Voices Choir is a non-audition community choir at Vox Academy, a 501(c)3 non-profit. We aim to heal and empower voices in our community. The choir is directed by Rebecca Stuhlbarg and accompanied by Daniel Hughes. The Healing Voices Choir Presents: Alleluia!